While I would not wish to argue that Greek Orthodoxy is in any way a “feminist” tradition, the shadow of the Goddess falls long over the two great festivals of spring and midsummer. In Greek Othodox tradition, there are two major spiritual holidays– Easter in the spring and the Dormition/Assumption of the Virgin at midsummer. The Panagia, She Who is All Holy, also known as Mother of God, Virgin, and Mary, is a central figure in people’s faith–dethroned neither by the Reformation nor by Vatican II. Indeed when I speak of the need for the “rebirth of the Goddess” in Greece, I am often told, “the Panagia is our Goddess.” This may not be theological orthodoxy, but it expresses a truth of practice. In Greek Orthodoxy, the birth of Christ, while celebrated along with the arrival of the Kings in early January, was not a central holiday until the coming of capitalist consumption only a few decades ago. The real celebrations of the Greek year are at Easter and on August 15. These are the times when families gather in their ancestral homes. The Greek Easter celebrations are called the “Divine Drama,” and the reference to Greek tragedies is clear. The highlight of the Easter celebrations for many is not the resurrection, which happens at midnight Saturday, but the death of Christ which is experienced on Friday night. On Thursday and Friday nights the women of my village enter into a state of mourning as intense as if it were their very own sons who died. When I first witnessed this, I was puzzled and slightly horrified. Now I have come to see women as major and perhaps the central players in the Divine Drama. For the four Fridays before Holy Week begins, the liturgy is dedicated to the “Saying Goodbye” of Mary to her son. Though they are prohibited from uttering the holy words reserved to the male clergy, on Fridays the women express their identification with the suffering of Mary, which helps them cope with the losses in their own lives. Women come to fore again on Holy Thursday night when the icon of Christ is hung on the cross. After going home to change their clothes, the women return to the church to perform an all-night vigil, during which they decorate the coffin into which the icon of Christ will be placed. 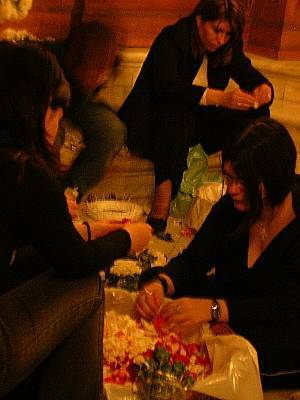 Traditionally the coffin was decorated with spring wildflowers collected from the fields. The priests are home sleeping during the women’s vigil, but return to the church in the morning to take the body down from the cross, where it is placed in the coffin or “tafos” the women have lovingly prepared. 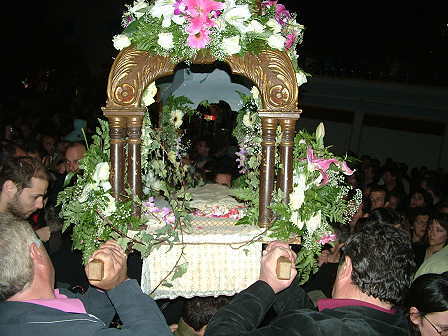 On Friday night, the coffin and its tabernacle, or “epitafios,” is paraded through the streets. The priests are followed by women (and men and children) who sing songs of death. While the Easter drama is usually understood as centering on the crucifixion and resurrection of Jesus, it can also be seen as providing women with the opportunity to re-enact Demeter’s grief at the loss of her beloved child. In August, the Panagia, She Who Is All Holy, also known as the Virgin Mary, takes center stage. For the first two weeks of August, women named Maria and Panagiota wear black, along with other women who have special prayers they hope to have answered. While liturgies are performed in the church, it is the women in black who announce the beginning of the Virgin’s ordeal. This holy drama comes to its culmination on August 15 when Mary “falls asleep” and the women remove their black clothing. On August 14 or 15, everyone who can do so, makes a pilgrimage to a church or shrine to ask for the Panagia’s blessing and intervention in their lives. In Greece August is the time of intense heat. The flowers are no more, and the last fruits must be quickly picked before they too are claimed by parched earth. The Panagia dies with the land. Her Assumption promises renewal. The promise is fulfilled with the first rains of autumn. When the rain waters the parched earth, the hillsides will be filled with “chloe,” greens, or as the Greeks of today call it, “chorta,” with which they will feed their families over the winter. 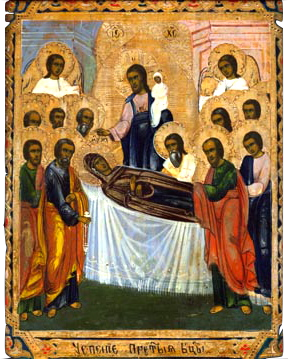 The icon of the Assumption portrays the Panagia as a babe in swaddling clothes, held in the arms of her son. As one of my friends remarked, this is a reversal of the natural course of events, where the woman brings forth the child from her body. However, the birth of the divine “daughter” can also be read as an echo of earlier rites in which Persephone was returned to Demeter after a long hot summer in the world of death. Carol P. Christ is a founding mother in the fields of women and religion and feminist theology. Her books include She Who Changes and Rebirth of the Goddess and the widely used anthologies Womanspirit Rising and Weaving the Visions. One of her great joys is leading Goddess Pilgrimages to Crete through Ariadne Institute. She has lived half of her adult life in Greece and is a dual citizen and bi-cultural hybrid. Great post, Carol…lots of inspiration here. Thanks! Such inspiration of the Holy Sacredness of Women. I remember finding myself on top a volcano on the Baja, Mexico. I sent my root into the earth and centered myself and got the message that a good friend and lover had made his transition. I began to cry and grieve his loss out of my cells and to the very depth of my soul and in union with the Earth and Volcano Goddess. I wailed for 3 days and marked the morning of each day with flowers and the celebration of Spring. My Christian friend who was with me joined in…….when we stopped… it was as though we had purged the earth and shared in unison the grieve of all women…..and gave back to the man named, Jesus. We sang our way down the volcano. When I reached America there was a message from my friend/lovers brother to call him…and you know what the message was for me.